August 10, 2017. Matt Kapp checking in as the new owner of Sanguine (ex Polly). Here is his email and we stand by for pictures an progress reports. If you can add me to the group membership so I can access the Forum that would be much appreciated. 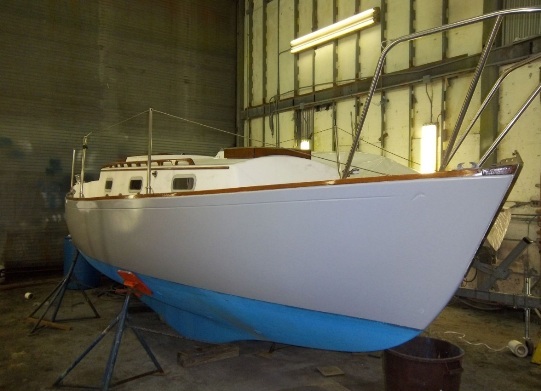 Many thanks in advance and will keep you posted on my progress with the boat. Nice to hear from you. Sanguine is doing well (if still covered in snow!). 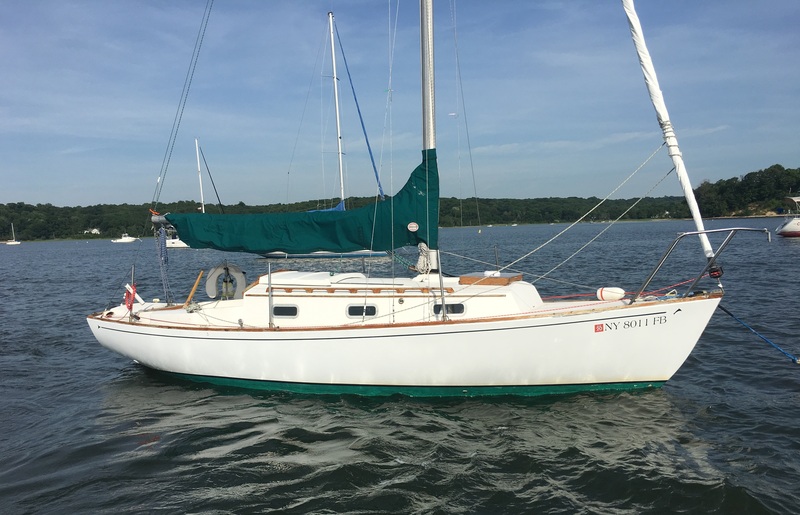 In late October we sailed her from Barron's Boatyard on City Island to Oyster Bay, where she's spent the winter. She's penciled in to splash at the end of this month. 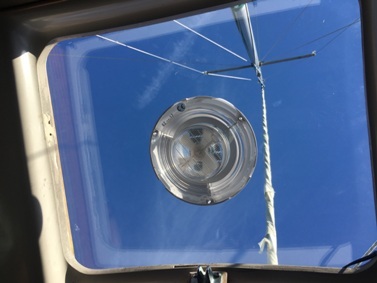 At right is a photo of the new V-berth hatch (with tattered old genoa UV guard above, since replaced). - To name a few! 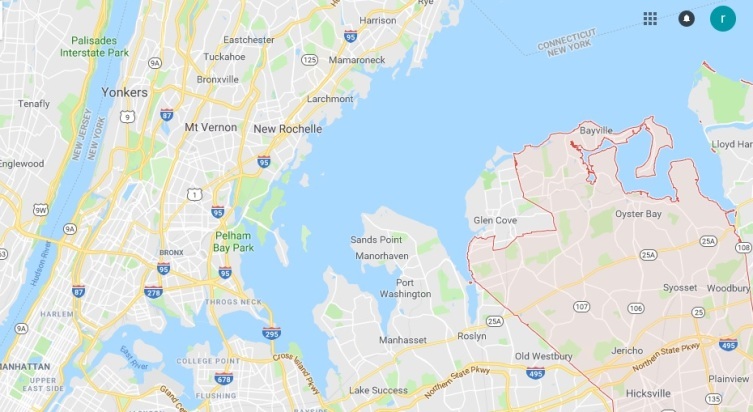 Webmaster Note: In keeping with our ongoing effort to familiarize readers with our Dolphin sailing waters here is Oyster Bay, New York. I hope you and Marionette are well and enjoying some late spring sailing! Sanguine splashed in mid-May in time for a quick trip from Oyster Bay down to Port Washington and back over Memorial Day Weekend. The Tohatsu 9.8 died (again) as soon as we got to Port Washington (conveniently conspiring with an unexpected squall to make for some interesting mooring-field maneuvers). We then had a five-hour up-Sound slog the next day into ENE 15-25 kts and steep 3-5 foot current-opposed breaking seas. The upside is the Dolphin handled marvelously, far beyond my expectations, with one reef in the main and various amounts of jib out. Never overpowered and tracked beautifully. The downside is the Tohatsu, which we just can't seem to get to run anywhere near reliably. So I'm thinking of re-powering with a Yamaha F6 or possibly a Mercury 6hp. Curious to hear your thoughts on this and if it makes sense to post something on the Dolphin24.org forum to see what other Dolphin owners think. Webmaster responds - Marionette's 1st race of the season on June 3 - we had 15-20 knots, gusts to 25. Not fun (4th of 8, ugh...). 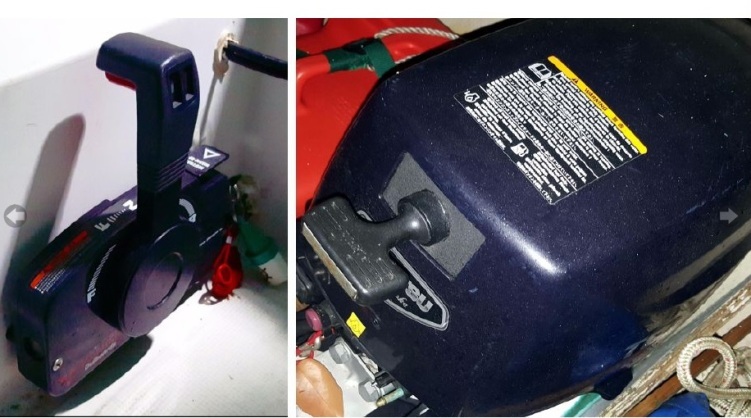 Check out Technical Section http://dolphin24.org/technicalindex.html and in particular this link - http://dolphin24.org/outboard_motor_comments.html. 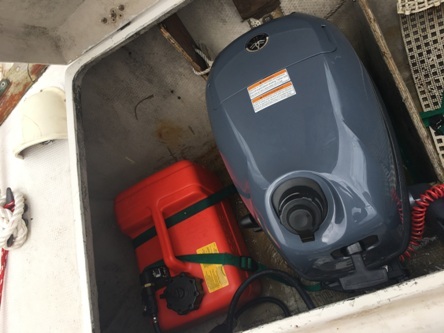 We've got the Forum back up and running - you can cruise thru it and find outboard motor stuff, and post your inquiries to maybe get updated info. Good Luck. I've decided to dispense with the Tohatsu and will likely go with a Yamaha F6. December 31, 2018 Responding to a webmaster Happy New Year, and update plea, Matt came in under the Y/E wire with this report. Same to you! I’m up in Camden Maine now (think I saw a Dolphin shrink wrapped in a driveway today!). I’ll get you a full OB motor report etc when I get back home. So far so good. Also thinking about putting a louver vent in the center companionway hatchboard in hopes of reducing the moisture issue in the cabin. I put in a solar nicro vent in the new plexi v-berth hatch but it’s not enough. 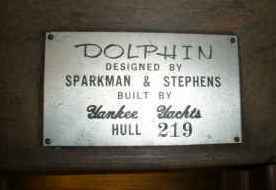 I saw another dolphin had a louver vent in the companionway board. I hope it makes a difference because I’d rather not add it if I don’t have to. We’ll see! Webmaster Replies Camden is Dolphin country! Several in the area - especially late July - Dolphin 24 New England Championships/Camden Classic Cup (2019 is July 25-27). Mark your calendar!! Re hatch louvers - check out http://dolphin24.org/covers.html - main hatch cover section - louvers are good but need 'protection'. Happy New Year! Here's a pic of the Yamaha F6 and a short video taken when it was first started. No issues with the motor since purchase in early August (and got a six year warranty just in case). Installed a Yamaha 10-micron fuel/water separator filter between the tank and motor which will hopefully ward off potential carburetor issues of the kind that plagued the Tohatsu 9.8. Fingers crossed. The F6 pushes the boat to hull speed at under half throttle. And early observations indicate a minimum of 8 hours run-time at hull speed per 3.1 gallon tank or roughly 40 nautical miles per tank, not bad at all. Also prelim observations indicate standard zinc anode on lower unit will need to be replaced twice per season (also exploring options for bigger anode to avoid this). It took some finessing to get the motor at the precise mounting level to make space for the pull-start (motor is manual pull-start only) to work through the cockpit cutout, but no issues since then with that either. - Rebed remaining leaky stanchion bases. 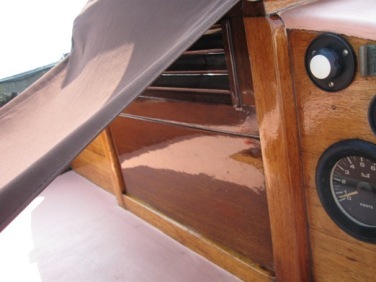 - Install Sea Dog stainless louvered vent in companionway hatchboard. Welcome to the world of classic Yachting, where you will be seduced by the elegance, and beauty of this twenty-four foot sailing yacht. Designed by the famous Naval Architecture firm Sparkman and Stevens, her aesthetically pleasing lines will have your heart. An early accomplishment of the firm, she boasts both beauty and efficiency, making for a truly eye-catching vessel that will have all your friends wanting to join you. 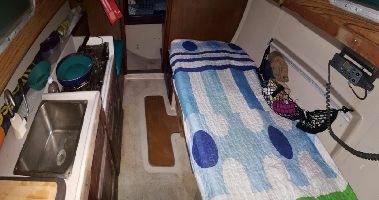 Her cabin is cozy and compact, perfect for camping out and cuddling up with your dearest, when moored at an anchorage far off somewhere. 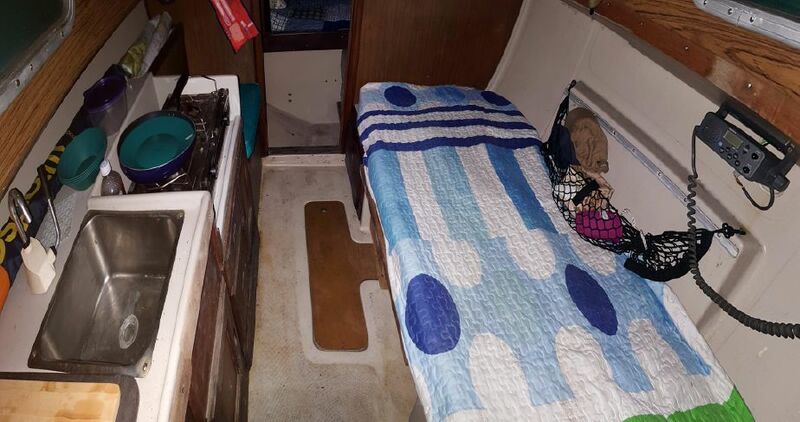 With her privately enclosed v-berth cabin, and her wide convertible settee in the main cabin, there's plenty of accommodation to invite a friendly couple for an overnight. Her spacious galley is sure to provide many salivating meals, prepared with the help of your Origo 3000 Alcohol stove. 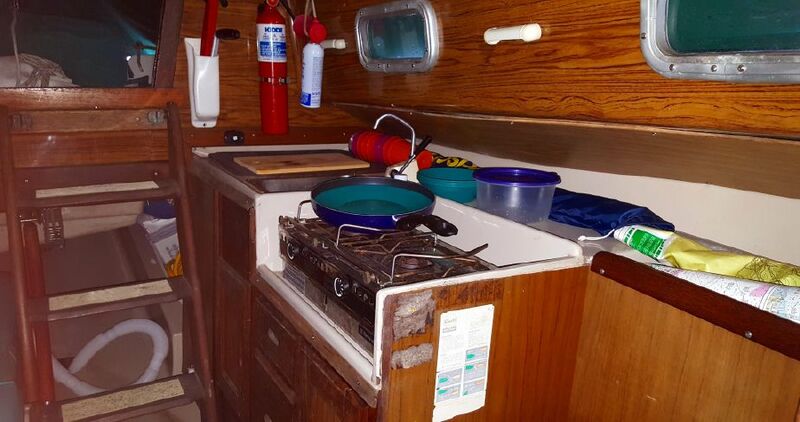 That means a safer way of cooking when at sea, or waiting out rough weather. 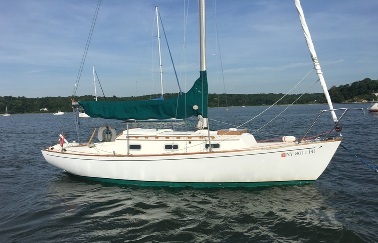 Her long and protected cockpit will have you feeling safe and able at the helm, all within easy reach of engine controls, sheets, and furling line. Behind you as you steer, her like-new Tohatsu Engine sits within an outboard well, a well-suited placement of power when in a heavy following sea. That's because the center of propulsion is deeper than on a conventional outboard-mount. This is your chance to own one of the finest yachts designed, right here on City Island. 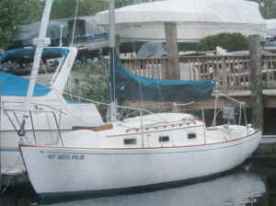 Come claim your Yankee Dolphin 24, while she's still available, on the hard, ready to launch this Summer. This is the history we had on Yankee #219 up until now. April 21, 2010 Noah Kornblum checked in last night as the new owner of Polly. 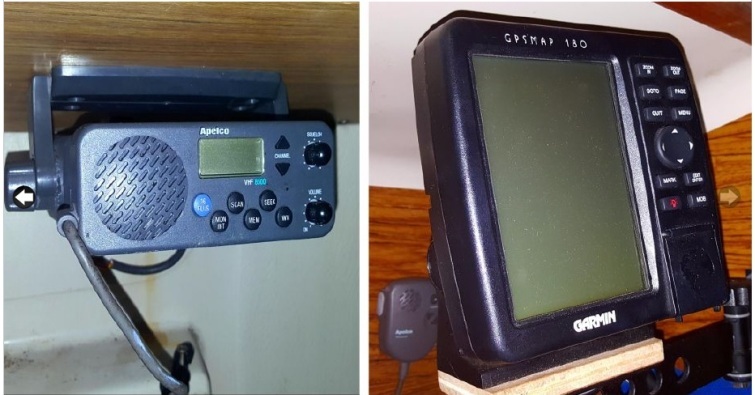 We first heard about this boat on March 12, 2010 from a post by Ed Fountain on the Sailnet Forum. It appeared for sale on Craig's List on 3/9/2010. Below are the pictures and listing information from the ad. 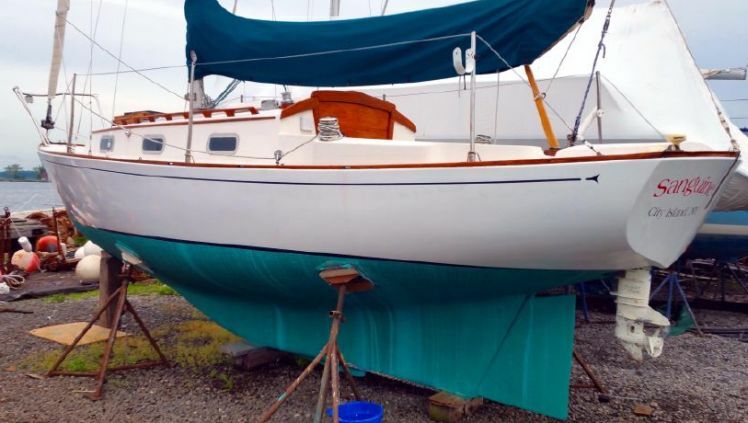 Stay tuned for more about Polly (including her new Homeport, and hopefully some pictures. Solid, well equipped family cruising boat. November 8, 2010, Noah checked in with a Dolphin 24 website book order and an update on Polly. Here is his email - edited. 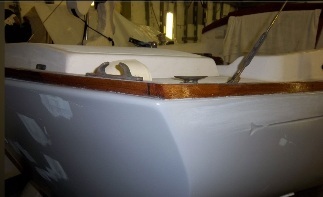 Polly will have her hull professionally stripped and painted this winter at Baron's Boatyard in City Island NY. We will rewire the mast and update standing and running rigging as required. 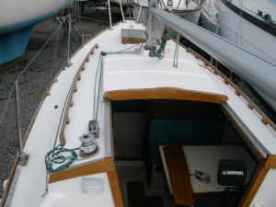 The sails will be inventoried and perhaps a new main if needed, but don't tell my wife (ha ha). January 29, 2011 Noah sent in the following update and pictures. Hope you are well. Thought I'd share these with you. Polly is getting a long needed face lift. These photos were taken at Barron's Marine in City Island NY. This is after two primer coats, but the final Awl Grip hasn't been done yet. The teak toe rail has been repaired and final varnish coats in the spring...Standing, running rigging and sails to be upgraded as needed in the spring fit-out. Nice day-dreaming pics for a snowy day. Postscript August 10, 2017 - missed this!! May 7, 2012. Noah sent in a copy of his dad's book At Sea in the City, a book about sailing around New York City in Tradition, an ancient (1910! 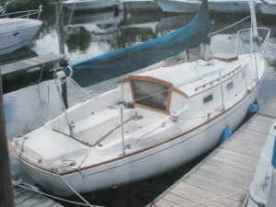 ), 24' Crosby built, New England catboat. It deserves a place on our recommended reading list - a fascinating read. Noah has sailed with his Dad on Tradition, and his dad sails with Noah on Polly. Click here to go to our Readling List Section for more on this book.